I suspect most North Americans are either engaged in Independence Day activities or thinking about them if they’re experiencing the impact of Hurricane Arthur. It’s also an appropriate day to be thinking about mission, though. 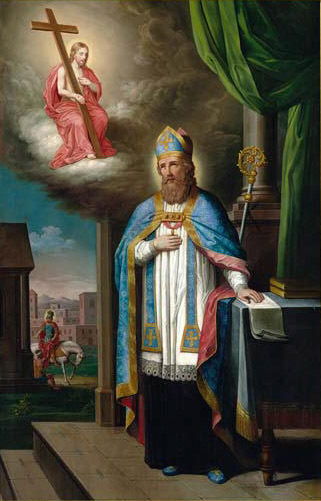 Today we remember the 4th century bishop, St. Martin of Tours. 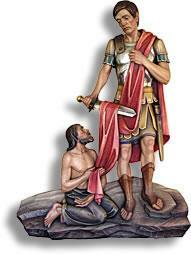 As legend has it, while serving as a Roman soldier in France one winter, Martin encountered a shivering beggar dressed in rags. Having no money to offer, Martin removed his cloak and used his sword to cut it in half. He gave the beggar half and wrapped himself in the other half. According to the stories, that night he had a dream in which he saw Jesus wearing that part of the cloak he had given away. The next morning he decided to be baptized. Many of us who engage in mission would express a similar sentiment to what Martin experienced in his dream. We, too, would say that we encounter Christ in the form of the poor. Through our various mission efforts, we provide food to the hungry, housing to the homeless, medical care to those in need, and so forth. Most global mission efforts tend to focus on these types of activities. We facilitate medical mission teams … we build housing, schools, and churches … we develop potable water projects … we provide assistance and seed money to start sewing cooperatives … we facilitate micro-loan projects for self-sustainability … and more. The last weekend of May was the convention of the Diocese of Colombia. Convention began with a Eucharist and business matters on Friday night and then shifted into programming and presentations on Saturday morning. In one of the first presentations, several non-Episcopalians invited by Bishop Duque gave a substantive presentation on a number of justice issues, presentations on gay rights and women’s rights. As we heard about and discussed women’s rights, we had discussions about issues such as reproductive rights, justice and equality in employment, family planning, and domestic violence. In the presentation and subsequent discussions about gay rights, we heard about public and domestic violence against gay people, the internalized conflicts that many experience living in a homophobic culture, persecution and marginalization in society, persecution in housing and employment, lack of medical care due to the inability to be honest about sexuality and related medical needs, and the lack of ability to form healthy households. As many Episcopalians are probably aware, Archbishop Welby spoke about the violence against Christians in Africa and the link between it and rising violence against the gay community. While I’ll leave the commentary on the Archbishop’s statement to Bishop Robinson (http://www.thedailybeast.com/articles/2014/04/13/what-the-archbishop-of-canterbury-should-have-said-about-gay-rights.html), I will share that the gay community in Colombia, and I suspect elsewhere, would say they are experiencing increased levels of violence that they believe is in direct response to new rights and equal marriage decisions in Western countries. In other words, for better or for worse, they believe their experience directly relates to the consecration of gay bishops, the ordination of openly gay people, and the ability of gay people in many Western countries to get married. In some cases, the violence they are experiencing extends to entire communities such as the church in Africa (and, again, I’m not agreeing or disagreeing with statements made by folks such as the Archbishop, but simply sharing my observations of a 2/3 world perspective, the term my friend and mission colleague, Titus Presler, would use to represent all those who are not part of the 1/3 of wealthy, developed nations. As I ponder all of the above, two things come to mind. First, what many of us perceive as “mission,” and second, the ways in which we are connected that we tend not to admit. As I reflect on the many ways in which we all engage in global mission, I find myself pondering things like human rights, social justice, economic justice, peace activism, racism, anti-Semitism, homophobia/heterosexism, and sexism. Is our mission work … the church’s work … about something more than building a school, digging a well, and so forth? Is it about something more than just serving the poor (which also begs the question of how we define “the poor”)? Yes, these are rhetorical questions, because I think we can all agree that God’s mission, which is or should be the church’s mission, is about all of those things. But the real questions for me are if and how they are reflected in our mission actions in the world. As for the second issue, can we ever really believe that our actions are just our own? Do we have some kind of responsibility to others around the globe as we nudge the arc of justice in our own environments? Can we really believe that our actions don’t have an impact on others … again, for better or for worse? To use a U.S. example, I would suspect that most gay people living in states with equal marriage bans would say that their lack of ability to get married had everything to do with the court’s 2004 decision in Massachusetts. In direct response to that decision, bans were enacted throughout the country. Similarly, the striking down of the Defense of Marriage Act (or DOMA) by the US Supreme Court, it could be argued, was the stimulus and motivating influence on more recent court cases striking down equal marriage bans as unconstitutional. While a resulting impact or backlash should never be the reason for holding back the arc of justice, I think it’s irresponsible to move forward without an appreciation for the many ways in which we’re all connected. We have a responsibility, at the very least, to acknowledge the broader impact of our actions. As I sat and listened to the presenters at convention, I pondered how our global mission activities could reflect this reality by engaging in more than the practical and offering some kind of hope and assistance for addressing the larger systemic issues of injustice. I understand these issues are complicated, and I’m the first to say that it isn’t my place to step out into the world with the mindset that “my way” is the right way or the only way, which is how addressing injustice in another culture could appear to some. In fact, you may recall that I struggled with this very issue in an earlier post … https://tedabroad.wordpress.com/2014/02/06/systemic-injustice. While we may not be in a position to start a social movement, maybe we can provide funding for a women’s program such as the one in Soacha, or an outreach program to the gay community like the one in Cali. As I try to put my thoughts into a theological framework, I’m drawn to the fact that we’ve just celebrated Pentecost, the descent of the Holy Spirit upon the Apostles. Isn’t Pentecost a sign of both our unity and diversity … a sign of a unified and diverse church? Doesn’t it point to the fact that we’re all connected? Doesn’t it call us to account in some way other than building a school or digging a well? I thank the ecumenical presenters at diocesan convention for the reminder and challenge that mission … the work of the church … is not just about serving those we understand to be economically poor, but about so much more. An interesting and challenging insight: Mission is more than relieving material poverty. It has to do with justice and freedom. How can we help others to freedom? Perhaps we can find some insights in the New Testament. Perhaps Jesus teachings, ministry, life and death and resurrection can help us to understand and engage in God’s mission, helping us, and our neighbors, to claim the freedom and dignity of the children of God. Your blogs are always insightful, Ted. I’ve often felt, upon reflection, that my own three years in rural Kenya at a mission hospital were not so much about “doing” nursing as about “being” in relationship — IN and WITH and OF a community. It was about one-on-one friendships, not about well-intentioned super-imposed projects. It was about gently encouraging a battered wife, over time, to believe there was something better for her — not about starting a community pharmacy that failed. It was about saving a baby’s life by teaching a tentatively-trusting mother how to uncover, rather than swaddle, her infant during an escalating malarial fever — not about creating whiteboard “to-do” lists for already-overburdened nurses. Every one of those relationships required time and trust. There are no easy answers, and challenges to individual OR systemic injustice are fraught with difficulty and potential repercussions. It can be unrealistic, even cruel, to give people hope if it is false hope. The cultural implications are huge, particularly where needs are great and tribal jealousies are real. But you know all this, just as you know we must still try — with enormous care and respect. Missioners always receive more than they could ever give, and the greatest gifts of my years in Maseno are the ongoing mutual relationships forged there over time. I suspect yours will be the same, Ted. May God continue to bless you in your thoughtful (and thought-provoking) life and work.